Sir Christopher Wren in Godfrey Kneller's 1711 portrait. 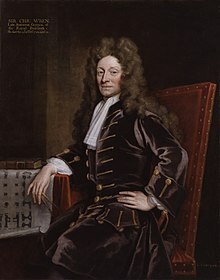 Sir Christopher Wren (20 October 1632 – 25 February 1723) was a 17th century English architect, designer, astronomer, geometer, considered one of the greatest English architects in history. Wren designed 53 London churches, including St Paul's Cathedral, as well as many secular buildings of note. He was a founder of the Royal Society (president 1680–82), and his scientific work was highly regarded by Sir Isaac Newton and Blaise Pascal. Architecture has its political Use; public Buildings being the Ornament of a Country; it establishes a Nation, draws People and Commerce; makes the People love their native Country, which Passion is the Original of all great Actions in a Common-wealth…. Architecture aims at Eternity. "Of Architecture", Parentalia; or Memoirs of the Family of the Wrens, comp. by his son Christopher (1750, reprinted 1965), Appendix, p. 351. Inaugural Lecture as Professor of Astronomy, Gresham College, as quoted in If the Universe is Teeming with Aliens-- where is Everybody? Fifty Solutions to the Fermi Paradox and the Problem of Extraterrestrial Life, by Stephen Webb (2002), p. 150. Conclusion of the life of Sir Christopher Wren, in The Magazine of Magazines, January 1759, p. 11.